In the upcoming years our primary objective is to implement and maintain an effective system of managing waste batteries and accumulators. The indicator shows the annual quantity of waste batteries generated and collected in Slovenia, methods of their management and shares of various types of batteries and accumulators containing hazardous substances. A battery or an accumulator is a source of electric energy generated by direct conversion of chemical energy. It is composed of one or more primary battery cells, which cannot be recharged, or secondary battery cells, which can be recharged. A waste battery or accumulator is any battery or accumulator which has been discarded because it can no longer be used or for other reasons and is intended for recovery or disposal. Hazardous substances in batteries and accumulators include metals (mercury, cadmium, lead) and electrolytes. - enable separate collection of waste batteries and accumulators, further recovery (recycling) and disposal of recovery residues. In 2004, it was expected that suppliers will place on the market 4.6 million kg batteries and accumulators, of which then approximately 38% waste accumulators and batteries were actually collected. From the envisaged 3 million kg batteries and accumulators to be placed on the market in 2005, two thirds waste accumulators and batteries were collected. Similarly, in 2006 two thirds of the envisaged 1.9 mio kg accumulators and batteries placed on the market in that year were collected. The Rules on the management of batteries and accumulators containing dangerous substances outline the principles of handling batteries and accumulators containing hazardous substances (mercury, cadmium, lead) in production, traffic and consumption. The Rules also determine the management and other obligations regarding reception, collection, recovery and disposal of waste batteries and accumulators. The reception, collection and recovery of waste batteries and accumulators discarded by users must be organized by the suppliers of batteries and accumulators, who must obtain a permit from the Environmental Agency of the Republic of Slovenia (EARS). Records of battery and accumulator suppliers kept by the Environmental Agency indicate that in 2007 there were 52 registered suppliers. 47 of them submitted reports on collected batteries and accumulators to EARS; 1 of those failed to provide all the required data. 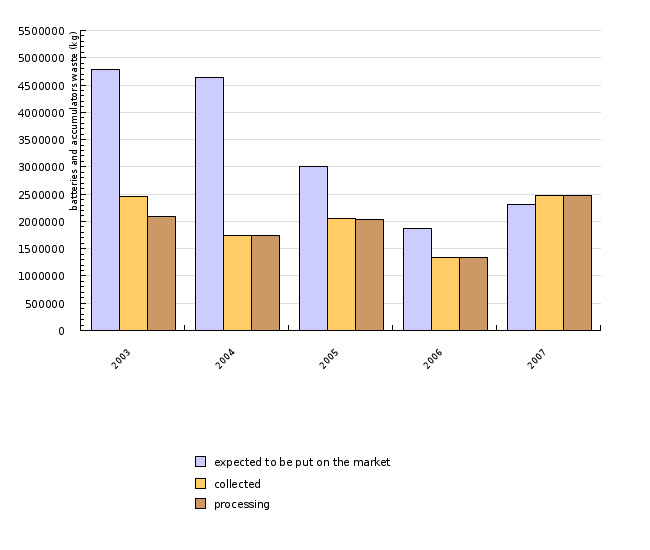 Based on the suppliers' 4-year projection submitted at the time of entry into the register of battery and accumulator suppliers, 2,311,877.50 kg of batteries and accumulators containing hazardous substances were anticipated to enter the market in 2007, which is less than actually collected, as 2,481004 kg of waste batteries and accumulators were collected in 2007. The source of data is reports submitted by battery and accumulator suppliers for 2007. The reason for such discrepancy was the fact that some suppliers only reported quantities of accumulators and batteries to be placed on the market and not their weight. Another important reason is also the fact that the suppliers whose certificate of registration as battery and accumulator suppliers expired before 2007, failed to submit application for a new certificate in which they should have stated the envisaged quantities of accumulators and batteries to be placed on the market per year in the next four years. 99.97% of batteries and accumulators were collected for the purpose of recovery, while the rest were intended for disposal. In 2007, lead accumulators were the most frequent items on the market (2,302,001 kg), followed by nickel-cadmium batteries or accumulators in much smaller amounts (9,319.85 kg), while batteries and accumulators containing mercury were the least frequent (556.65 kg), in total 2,311,877.50 kg. Thy system of waste batteries and accumulators collection in Slovenia still is not operating in an organised manner. However, this does not apply to the collection waste lead accumulators with the estimated share of 90% collection of all lead accumulators which appear on Slovene territory. The collection is mainly carried our by registered collectors at collection points in motor spare part shops, car battery centres and car repair shops, at service stations, and to a smaller amount also by public waste management services as separate collection of hazardous fractions of municipal waste. So far, Slovenia has no recovery facilities for waste batteries, since recovery procedures are yet under development even at world level; of importance is also the economic beak-even point of rational recovery, which is essentially above the quantities generated in Slovenia. In Slovenia, recycling of waste lead accumulators is carried out by MPI, Žerjav, Črna na Koroškem. By implementing EU regulations related to the management of waste batteries and accumulators containing hazardous substances, we gradually succeeded in reducing environmental burdens from heavy metals contained in waste batteries and accumulators. Ban on the marketing of batteries exceeding the permitted limits of mercury, cadmium and lead contents, specific labelling of such batteries, mandatory separate collection, recycling and controlled disposal, all that contributed to the situation that mercury practically disappeared from batteries for general consumption, that nickel-cadmium accumulators are withdrawing from the market giving place to less hazardous new types, that the manganese component in alkaline batteries is replaced by environmentally more acceptable ferrous component, that lead accumulators, although still indispensable for starting piston engines, became more efficient per unit of weight and their useful life twofold extended, and that the stable price of lead allows for economical recycling. In the years to come, Slovenia particularly desires to achieve implementation and operation of an effective system for the management of waste batteries and accumulators containing hazardous substances, placed on the market by various suppliers; the measures applied will be directed in the prevention of mixing waste batteries and accumulators with municipal waste, collection of waste batteries and accumulators retailers who place such batteries and accumulators on the market, recovery and disposal of recovery residues of collected batteries and accumulators according to waste management regulations, and recovery and disposal of waste batteries and accumulators collected by separate collection of hazardous fractions of municipal waste. To achieve the above objectives, awareness raising and information of the target public (consumers) and their participation are of essential importance. They shall above all be informed and advised about possibilities of returning waste batteries and accumulators containing hazardous substances at retail outlets, about hazards of uncontrolled disposal of waste batteries and accumulators, about labelling of batteries and accumulators and appliances containing permanently installed batteries and accumulators, and about disposal methods of permanently installed batteries and accumulators. Of equal importance for reaching these objectives is the supervision of organised collection and reception of waste batteries and accumulators, control of retail outlets to be properly equipped with instructions to customers on appropriate handling of batteries and accumulators and control of retail outlets to be properly equipped with collection points for waste batteries and accumulators, as well as supervision over implementation of regulations governing the management of waste batteries and accumulators with regard to separate collection, recovery and disposal of batteries and accumulators. Waste Management Documents, Environmental Agency of the Republic of Slovenia, 2007; Annual reports. Data on the quantities of batteries and accumulators containing hazardous substances and their management are derived from Reports on collected waste batteries and/or accumulators containing hazardous substances and their management.